Much to be proud of from my chosen city. 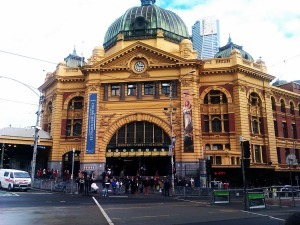 If you’ve never experienced Melbourne, you may be surprised by its history. And no, it’s not Gotham. Happy birthday, Melbourne – 180 years old tomorrow! And perhaps, let’s be honest, not entirely sure what anniversary it is you’re celebrating. If Prime Minister Abbott does cross this Rubicon, so will Australia and God help Australian democracy. This article goes along w/ my latest post about the direction the country is heading. The topic is even more frightening than the gag on contractors. This threatens all of us: the citizens, with the potential for a government minister to take away our right to citizenship – be we born here or brought here or those of us like myself who chose to come here. When that level of power, based on suspicion, ‘guilty until proven innocent’, is proposed and is spouted proudly by the minister as exactly the point when challenged by the likes of Barnaby Joyce, the descent into fascism is one step farther on the track.